Cirrascale Corporation®, a premier developer of blade and rackmount solutions enabling GPU-driven deep learning infrastructure, today announced its popular line of multi-GPU servers -- the GX4 Series, the GX8 Series and the GB5600 Series -- have been updated to support the Intel® Xeon® processor E5-2600 v4 product family. The highly anticipated processors, formerly codenamed Broadwell, are specifically designed to deliver unparalleled performance and versatility across diverse workloads. Breaking through the “performance wall” becomes increasingly critical as data volume and complexity grow. The Intel Xeon processor E5-2600 v4 product family is designed to deliver improved absolute performance and performance per watt for deep learning, cloud, and HPC workloads and applications. The combination of Intel Xeon processors and Cirrascale infrastructure improves bandwidth and reduces latency throughout the system, providing a high-performing, highly scalable solution. Additionally, enhancements to the DDR4 memory technology support for up to 3TB per socket in dual socket configurations. This provides increased bandwidth and power efficiency while enabling higher overall memory bandwidth of up to 2400 megatransfers per second (MT/s). The Cirrascale GX4 Series, the GX8 Series and the GB5600 Series blade and rackmount server product lines are immediately available to order and will be shipping subject to the announced component availability. Licensing opportunities will also be available immediately to both customers and partners. 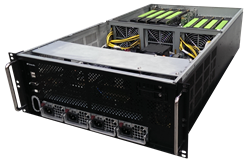 Cirrascale Corporation is a premier developer of blade and rackmount solutions enabling GPU-driven deep learning infrastructure. Cirrascale leverages its patented Vertical Cooling Technology and proprietary PCIe switch riser technology to provide the industry’s densest rackmount and blade-based peered multi-GPU platforms. The company sells hardware solutions to large-scale deep learning infrastructure operators, hosting and cloud service providers, and HPC users. Cirrascale also licenses its award winning technology to partners globally. To learn more about Cirrascale and its unique multi-GPU infrastructure solutions, please visit http://www.cirrascale.com or call (888) 942-3800. Cirrascale, BladeRack, Vertical Cooling Technology, and the Cirrascale logo are trademarks or registered trademarks of Cirrascale Corporation. Intel, the Intel logo, Core, Xeon, Iris and Intel Inside are trademarks of Intel Corporation in the U.S. and other countries. All other names or marks are property of their respective owners.